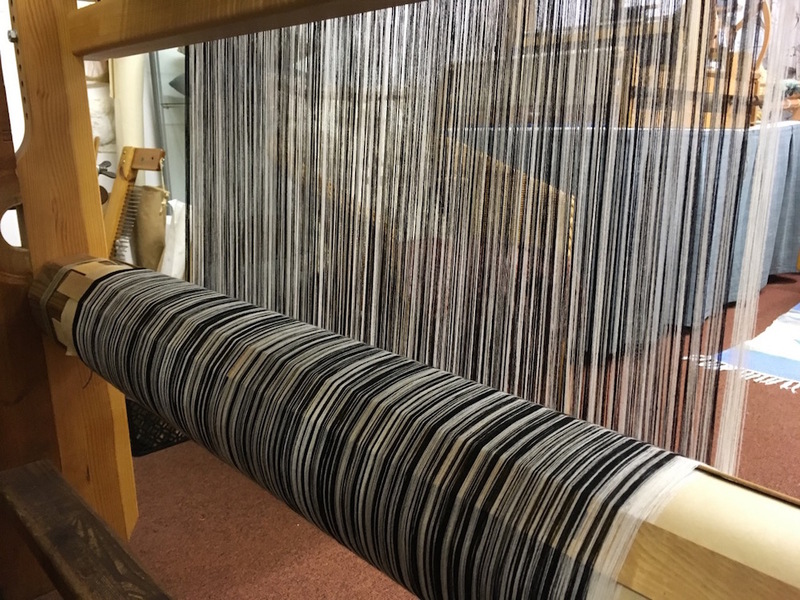 My most recently completed plaid was very different to the heavy fabrics that I had previously woven; Keith’s Shepherd’s Plaid was designed for outdoor wear in the traditional style, heavy, densely woven wool to withstand the weather in the uplands. 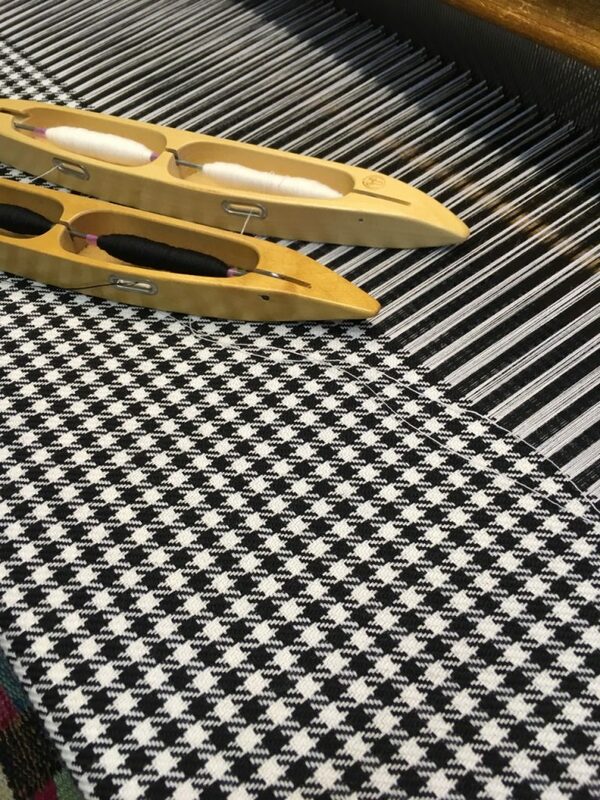 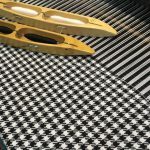 Stephen’s piper’s plaid was required to fit in with existing plaids worn as a uniform in his Northumbrian Pipe band; the fabric is very light-weight wool, dyed and bleached so the colours are very black and white, rather than the softness of the natural colours; a far narrower fabric designed for show rather than function. 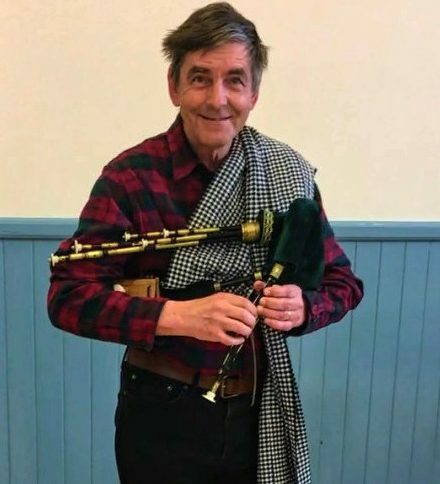 The band members’ existing plaids were made from commercially woven fabric and my task was to replicate this closely so Stephen wouldn’t stand out from his band colleagues; the yarn I chose was a very fine worsted wool, so fine I had to use it double to achieve the required weight. 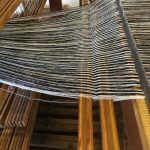 Despite this, it was very easy to work with and, once the loom was dressed, weaving progressed quickly. 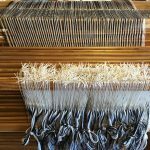 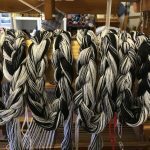 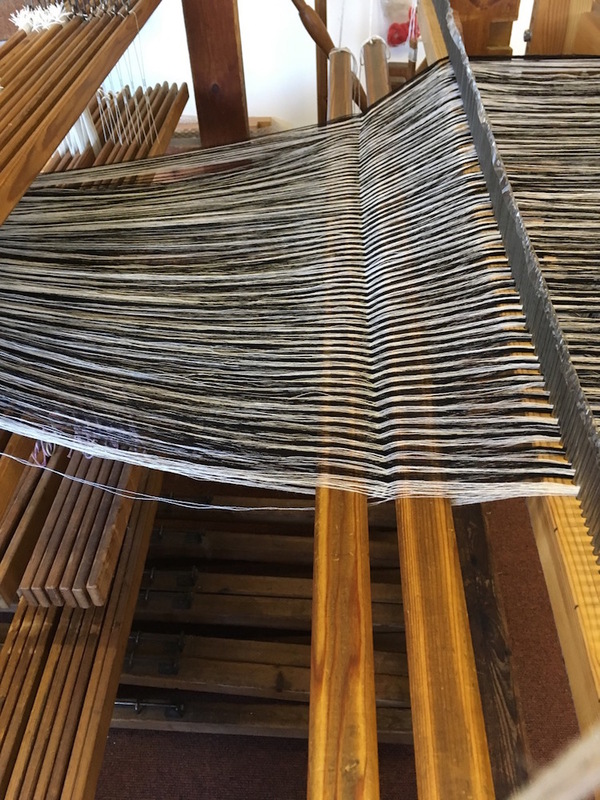 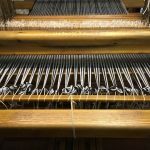 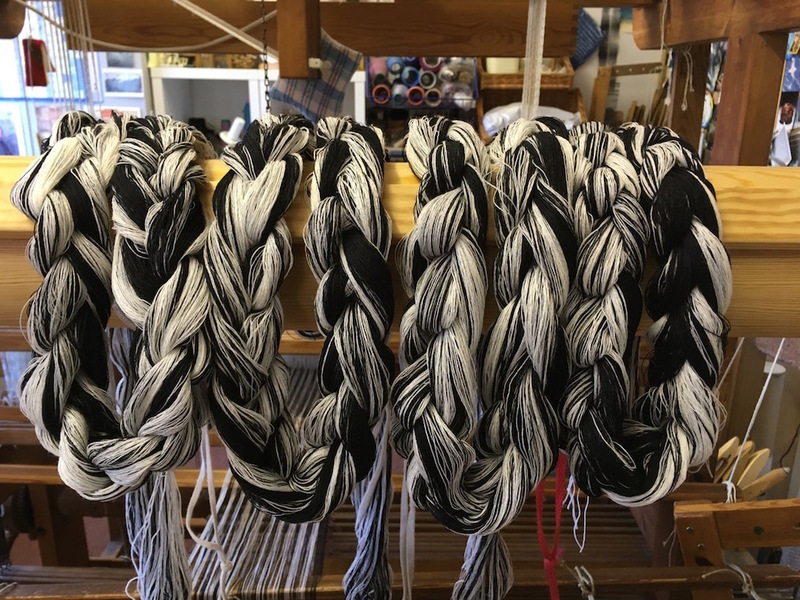 The weaving process also differed from the heavier plaids which required very heavy beating and regular breaks; this one was an absolute joy to weave, it required only a very light beat and, because it was narrower, I didn’t need to stretch to insert the shuttle. 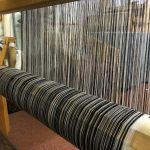 This plaid also differed from Keith’s in its overall design; you can see that Keith’s plaid had striped designs around the perimeter of the plaid, making it very specific to Keith’s design, whereas Stephen’s, having to harmonise with the others’ needed uniformity. 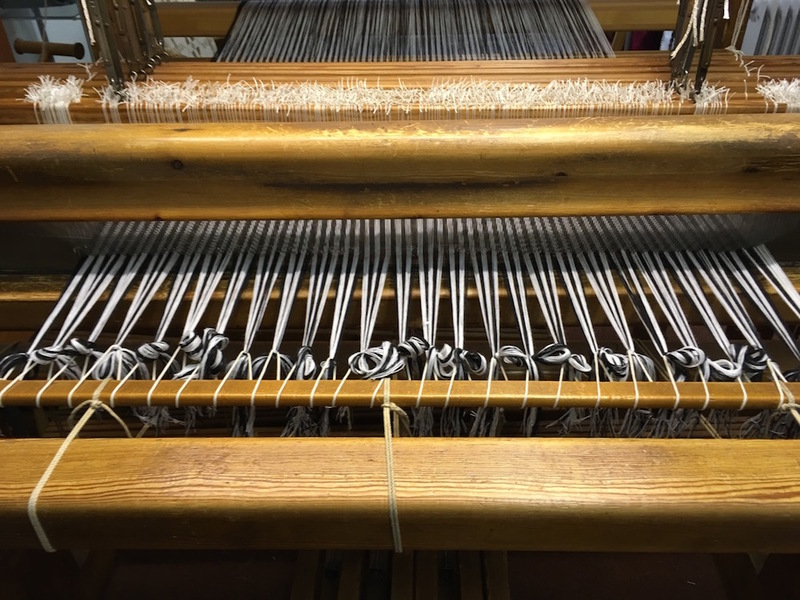 The only personal element that made its way into the design was one black selvedge and one white selvedge, which, if you weren’t looking for it, you might overlook. 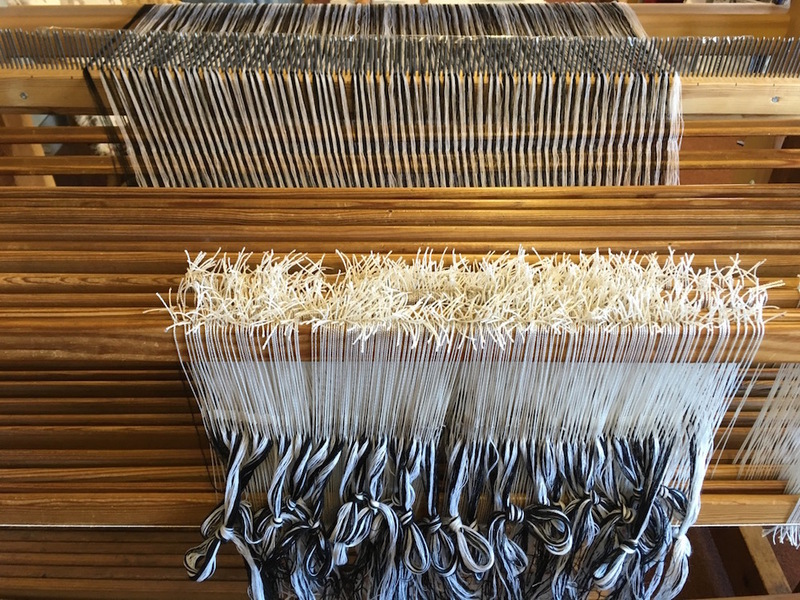 Once weaving was completed Stephen’s wife pleated and stitched the plaid to match the others in the band, giving the plaid a certain amount of rigidity in its appearance; the stitching and pleating make it easier for the pipers to wear their plaids in exactly the same way adding to the uniformity of the garment. 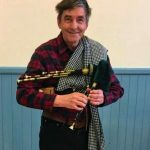 During a performance, the plaid would be worn with a brooch to secure it to the shoulder.